Gunsmith Darrell Holland sells a priming tool that upgrades the RCBS Auto Bench Priming Tool with key features — including primer seating depth control. If your hand starts to hurt after priming dozens of cases with a hand-held, squeeze-type priming tool, you may want to consider Holland’s invention, which he calls the “Perfect Primer Seater” (PPS). Holland basically has modified the RCBS lever, adding a precise crush control and a means of measuring depth with a gauge. He claims this gives “an EXACT primer seating depth based on primer pocket depth and primer thickness”. With Holland’s PPS, primer seating depth is controlled with a rotating wheel that limits lever travel in precise gradations. You can buy the complete priming system for $215.00, or, if you already own the RCBS Auto Prime tool, you can purchase an adapter kit (with base, arm, adjuster, and gauge etc.) for $120.00. To order, visit Hollandguns.com. Click on “Reloading Equipment”, and look for the Perfect Primer Seater. Scroll down to the bottom of the page to add items to the shopping cart. Share the post "Darrell Holland Upgrade for RCBS Bench Priming Tool"
For centerfire rounds, consistent ignition (and low ES/SD) all begins with the primer in the base of the cartridge. When the firing pin strikes the primer, it sets off a small flame/spark which lights the powder in the case. Energy from that burning powder pushes the bullet out of the cartridge, down the barrel, and out to the target. It’s fair to say, then, that accurate shooting all begins with the primer. When seating primers, consistency counts. You want to make sure the primer is fully seated in the primer pocket in the base of the case. You want to ensure a slight bit of crush (flattening) for proper seating, and it doesn’t hurt to have very consistent primer seating depths. That’s why guys use tools to uniform their primer pockets. Here’s a new tool that lets you measure the consistency of primer seating depths. We haven’t used this device yet, but Forum members have reported it works well — measurements are quick and repeatable. Will this tool lower your ES/SD or improve accuracy? That’s hard to say. However, it will definitely help you detect when a primer in a loaded round is seated too high or too low — that’s important. In addition, it can give you precise measurements for comparison testing with different types of primers. The Accuracy One Precision Primer Gauge will precisely measure primer pocket depth and the depth of seated primers in relationship to the face of the case head. The Precision Primer Gauge can also be used to measure the thickness of an unseated primer, allowing you to calculate the optimum seating depth for the particular primers and cases you are loading. Case Compatibility: The Precision Primer Gauge works with 300 Win. Mag case head diameter (.532”) cartridges, .308 Win. case head diameter (.473”) cartridges, and .223 Rem case head diameter (.378”) cartridges using either large or small primers. The Precision Primer Gauge can be ordered via phone, or by sending in the PDF ORDER FORM form via mail or email. Assembly Tips: Nylon screw is provided for securing the gauge body to the indicator. The contact point of the indicator must be removed to provide proper function. Also, please note that the standard gauge body is not compatible with cartridges that share the .338 Lapua case head diameter unless the diameter of the magnum step is machined to .595” to accept the larger diameter case head. This modification of the gauge body is available upon request. Share the post "New Accuracy One Precision Primer Gauge"
In two recent Midsouth Blog articles, Glen Zediker offers helpful advice on priming. First he examines what happens to the primer itself as it is seated in the cup. Glen explains why some “crush” is important, and why you never want to leave a high primer. Glen also reviews a variety of priming tools, including his favorite — the Forster Co-Ax Bench Primer Seater. Then he offers some key safety tips. Glen provides some “rock-solid” advice about the priming operation. 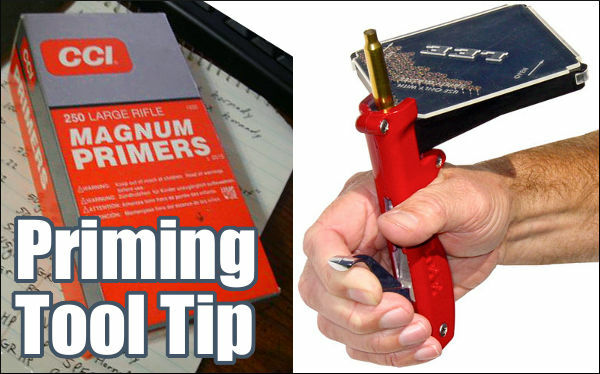 You’ll find more great reloading tips in Glen’s newest book, Top-Grade Ammo, which we recommend. Share the post "Glen Zediker Offers Smart Advice on Priming"
“I had issues with CCI 450s when I had my first 6BR barreled. I had probably three or four out of 20 rounds that failed to fire. the primers were dented but didn’t fire. I called CCI since I had bought a case of them. The tech was decent enough but had the audacity to tell me I was not seating the primers all the way in the pocket. I proceeded to let him know I had been reloading longer than he had been alive and I knew how to seat a primer. Turns out that I did and I didn’t! I was using the RCBS primer tool I had used for years and the primers felt just fine to me. I finally decided to check the tool and since I had a new one I took the seating pins out and measured them. The seating pin on the tool I had been using for years was shorter by a few thousandths! I then used the pin from the new primer tool and darned if the primers that didn’t seat down to the bottom of the cup. Share the post "TECH Tip: Check Your Primer Tools If You Have Primer Problems"
Here’s a very handy cartridge information sheet you will definitely want to save for future reference. Shown below is Page One of the Primer Size and Bullet Diameter Chart created by Graf & Sons. This chart shows the bullet diameter and primer size for more than 320 popular cartridges. The full three-page chart is available in PDF format for easy printing. NOTE: If you have the PDF reader installed in your browser, the Graf’s Chart may open in a new tab when you click on the image above. To save the three-page PDF file to your computer or device, click the Floppy Disc icon that appears in the lower right (after the PDF file opens). Here is the direct link: http://www.grafs.com/uploads/technical-resource-pdf-file/12.pdf. Note: There are a few issues which arise from brass sources. For example, if you are making 22 BR from Lapua brass, you’ll want a small rifle primer. And the 6.5 Creedmoor is not listed (it uses Large Rifle primers for most brass, but Small Rifle primers for Lapua brass). There are a couple other oversights, so we recommend that you double-check your brass before you buy a truckload of primers. Resource Tip from EdLongrange. We welcome reader submissions. Share the post "Download Free Primer/Bullet Spec Table for 320+ Cartridges"
Gunsmith Darrell Holland has invented an interesting upgrade to the RCBS Auto Bench Priming Tool. If your hand starts to hurt after priming dozens of cases with a hand-held, squeeze-type priming tool, you may want to consider Holland’s invention, which he calls the “Perfect Primer Seater” (PPS). Holland basically has modified the RCBS lever, adding a precise crush control and a means of measuring depth with a gauge. He claims this gives “an EXACT primer seating depth based on primer pocket depth and primer thickness”. With Holland’s PPS, primer seating depth is controlled with a rotating wheel that limits lever travel in precise gradations. You can buy the complete priming system for $215.00, or, if you already own the RCBS Auto Prime tool, you can purchase an adapter kit (with base, arm, adjuster, and gauge etc.) for $120.00. To order, visit Hollandguns.com then click on “Reloading Equipment”. Share the post "RCBS Bench Priming Tool Upgrade by Holland’s Gunsmithing"
The tool-makers at 21st Century Shooting have come up with a very slick new Precision Hand-Priming Tool. This extremely well-made, benchrest-grade unit raises the bar among single-primer seating tools. Feel is great, changing shell-holders is simple, and nothing else on the market offers better control over primer seating depth. The tool’s precision-adjusting head provides clicks in .0025″ increments for precise seating depth. The tool’s body, internals, and shell-holders are stainless, while the handle is anodized aluminum. Price is $118.00 for the tool itself. Shell-holders (sizes from 17 Remington up to .338 Lapua Magnum) cost $7.99 each. I have been priming cases, with various hand-priming tools, for about three decades, and in the process have pretty much tried them all, from least to most expensive. When I found out that this new 21st Century tool was adjustable for seating depth, I wondered about that. After all, what do I, who believes in seating by feel, need with adjustable seating depth? Well…..I was wrong. Let me explain. Most hand-seating tools do not have an adjustment for how far up the priming punch comes up into the shell holder. As a result, when priming a case with a deep pocket, especially if there has been some wear of the tool’s linkage, the finger/thumb lever may contact the tool’s body before the primer is fully seated. Having a primer seated too high can cause a myriad of problems. Prior to this, the only seater that I had used that had an adjustable linkage was the Sinclair tool, and adjusting its linkage requires disassembly — regular disassembly if you want to keep it perfect. That’s not convenient. The Sinclair is good tool, but a pain in the neck to adjust. The 21st Century Priming Tool offers quick and easy depth adjustment (unlike its rival from Sinclair). The 21st Century unit can be adjusted in precise increments (.0025”) more quickly than you can read this sentence. The knurled head of the tool is threaded onto the body, which has a very sturdy ball and spring detent indexing system that is easy to adjust and precise. Clicks are secure and positive. With this feature, you can set the tool so that the handle is in any position (distance from the tool body) that you find convenient, when the primer is fully seated. Additionally, since leverage increases as the handle approaches the tool body, different stopping points afford differing mechanical advantages (more or less effort required) and sensitivity. By doing a little experimenting, I have found a point of adjustment that give me better feel for when the primer hits the bottom of the pocket, without overshooting the mark, while keeping the force requirement within a range that is comfortable when priming a large number of cases. Changing shell holders is easily accomplished. No extra hex-wrenches or tools are needed, and there are no tiny set screws to roll of the desk, to be lost forever in the carpet, never to be heard from again until you hear them rattling up the vacuum cleaner hose. To swap shell-holders, simply screw the head off of the body, lift off the one that you one that you are replacing, set the one that you intend to use in place (assuming that it used the same size primer) and screw the head back down to the setting that you want. Changing primer sizes is equally easy. NOTE: The tool requires 21st Century-made shell holders. These may be turned (relative to the handle) so that the loading slot opening faces whatever direction you prefer. The body and head of the tool, as well as the internal linkages, are all made from stainless steel. These closely-fitted parts are precisely machined, with an smooth, attractive finish. The handle is black anodized aluminum. Overall, the tool is well-shaped, and built like a stainless/aluminum brick. I can’t imagine anyone, who uses a single-primer tool of this type, not liking this tool. When it comes to hand reloading tools, I can afford to have pretty much whatever I want (within reason). After testing and using this tool, I pulled my Sinclair tool from its case, and replaced it with this one. That should say it all. After using this tool, I will have to give serious consideration to other 21st Century reloading products the next time I need a new tool. One thing is for sure — we have an important new player in the design and manufacture of top end of reloading equipment. 21st Century’s Precision Priming Tool “raises the bar” among single-primer seating tools. I wrote the review and then took the pictures, which, upon reflection, make the tool look smaller than it is, because of the size of my hands. I thought about putting a ruler in the pictures, but rejected that as visual clutter, so I will simply tell you that from tip of thumb to that of my little finger, my right hand measures a little over 10 inches, and the palm is 4 inches wide. The size of the tool is just right. Share the post "Outstanding Primer Seating Tool from 21st Century Shooting"
John Perkins of 21st Century Shooting has created new, benchrest-grade hand priming tool that offers the ability to adjust primer seating depth. John is a skilled tool-maker and machinist who has designed reloading tools for major companies including Davidsons and Sinclair International. Guaranteed for life and beautifully constructed from anodized aluminum, the unit costs just $79.99 with five (5) precision brass shell-holders (Lee shellholders can be used as well). The current tool design employs Lee plastic primer trays, though billet aluminum trays will be offered in the future. The tool will come with five popular shell holders, including #2, #4, #5, M and PPC. Shellholders are made of brass and “fit much nicer” than the Lee shellholders, according to the tool’s designer. You can also use normal Lee shellholders. You can order the priming tool directly from 21st Century Shooting, 260-273-9909. Price is $79.99 plus shipping. The tool comes complete with five shell-holders (#2, 4, 5, M, PPC) and allen wrench, but you will need to supply your own Lee plastic primer tray. 21st Century Shooting provides a 100% Money Back Guarantee. Share the post "New Hand Priming Tool Offers Adjustable Primer Seating Depth"